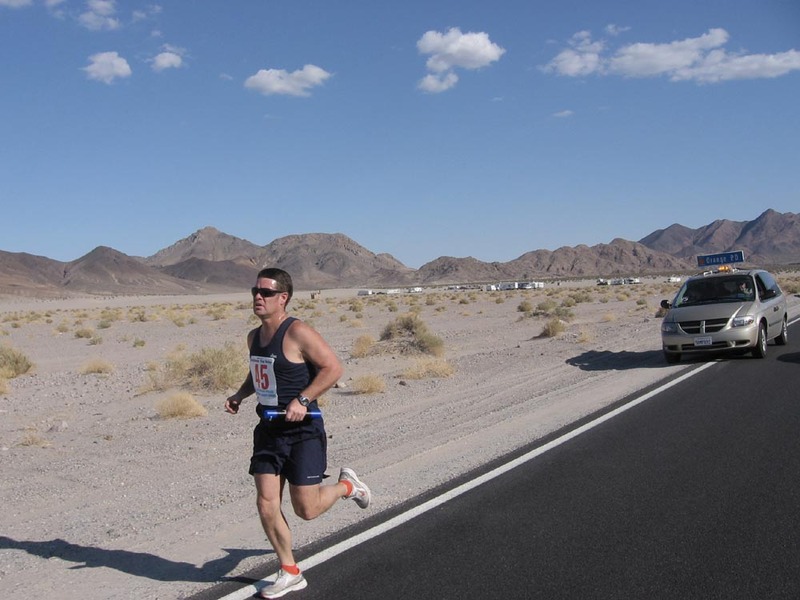 Here is a terrific view of the open desert with the OPD runner (Team #45) leading what seems to be an endless line of runners and support vehicles from the competing teams. 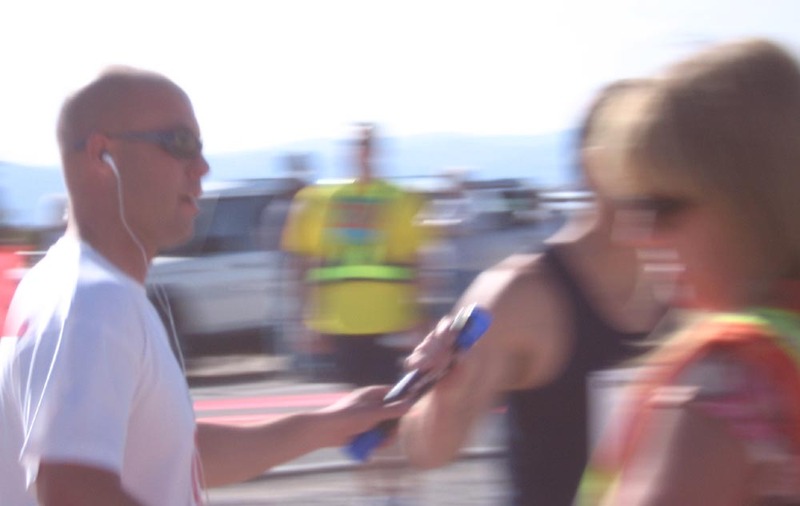 The Orange PD runner on the left is handing off the "baton" to the next runner during the race. 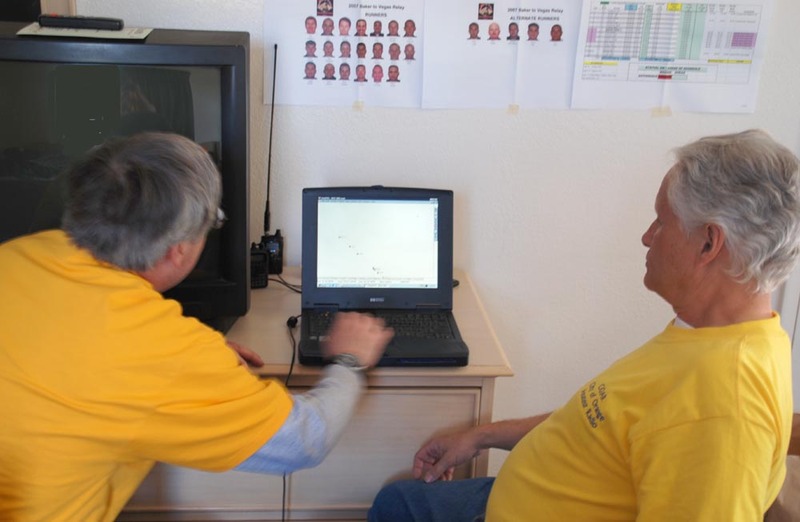 Radio operators from the OCARC and Cypress manned the third communications center in Pahrump. 144 MHz simplex was used as the primary channel for "back bone" communications. 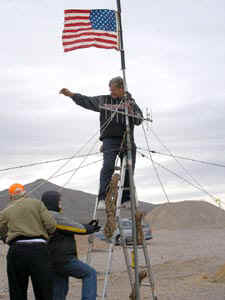 A cross-band repeater with 440 MHz that was located in Sandy Valley linked the "back bone" to Las Vegas. The reserved room at Pahrump got given away Friday...so we had to set up a temporary antenna for Friday voice Radio checks and Saturday morning radio checks. 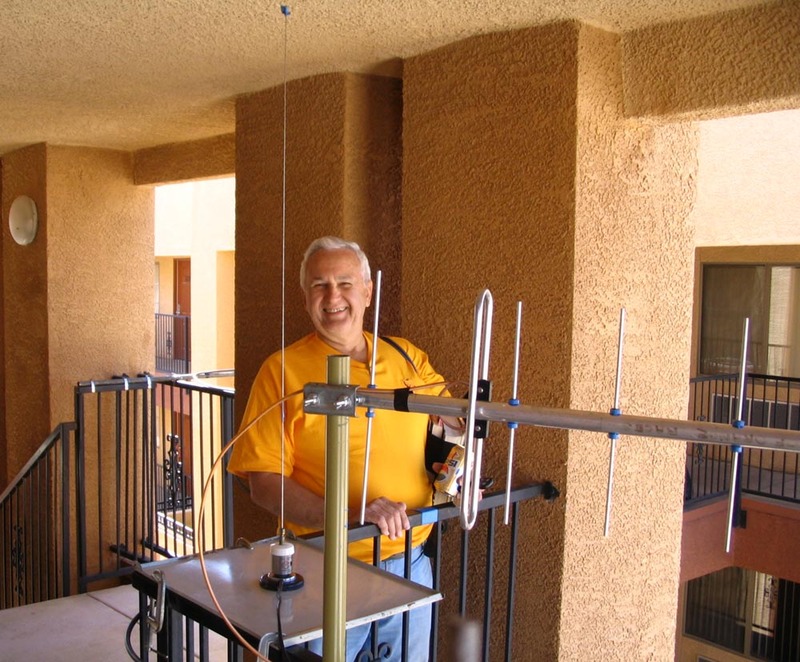 Mike-KF6QFY inspects the temporary APRS 2M vertical that was set-up on a railing just before we move the antenna to the permanent location for the race. 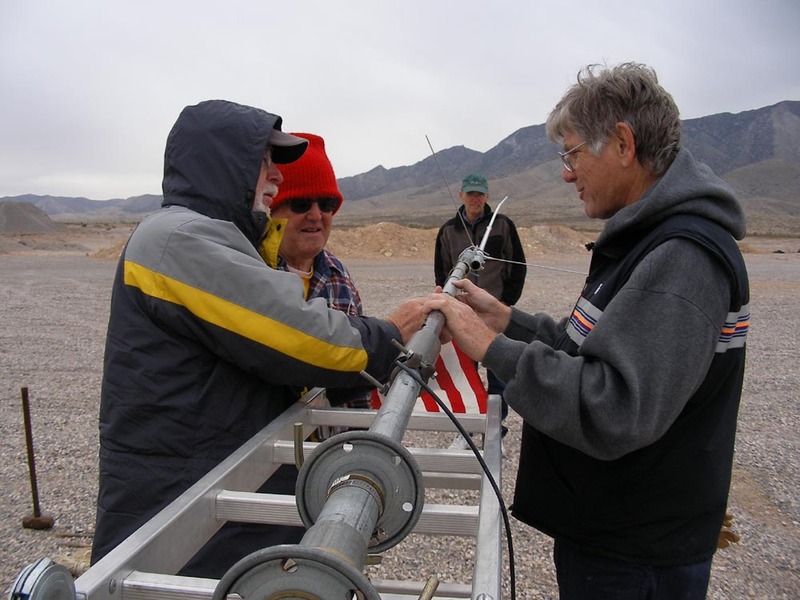 After we moved to the permanent location for the Pahrump communications center, Bob-AF6C makes final adjustments to the set-up. There were two Kenwood G707 dual-band rigs used for voice communications on 144 and 440 MHz. 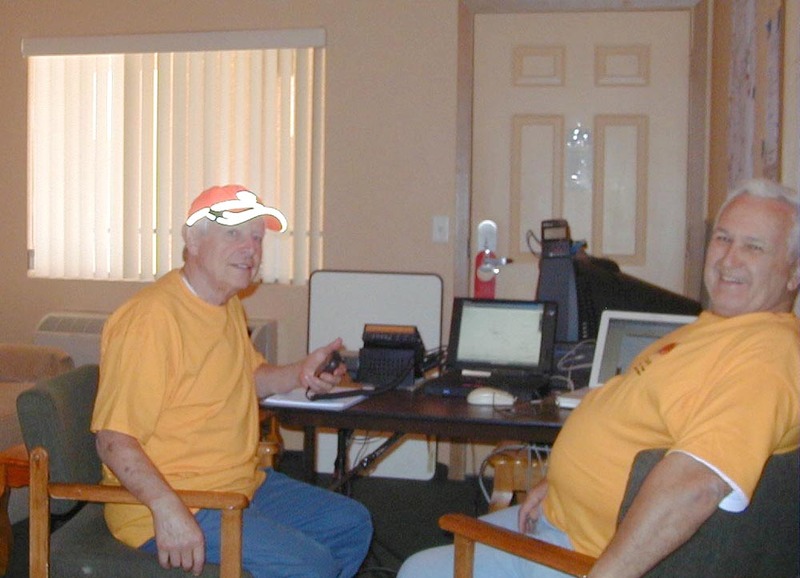 Bob-AF6C (L) and Nicholas-AF6CF (R) check out the runners on the APRS tracking computer in Pahrump. 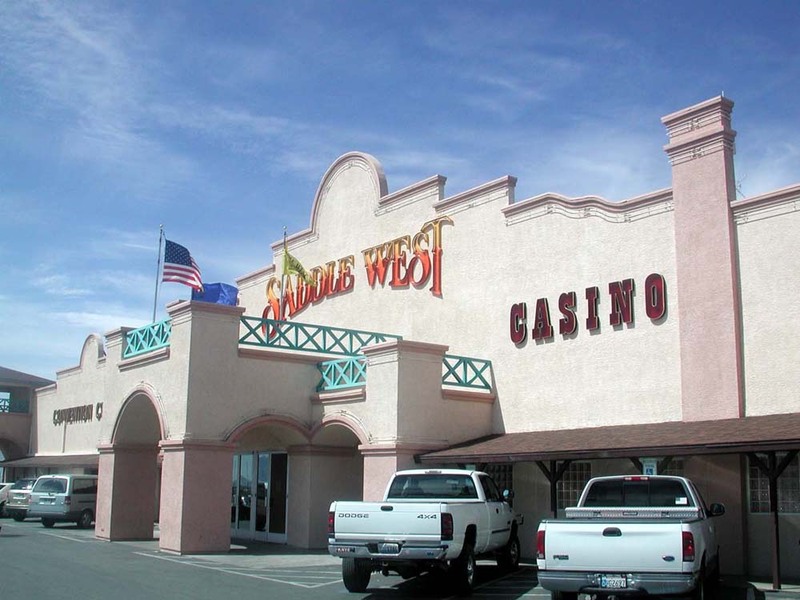 By late night at the Pahrump comm center, drivers and runners and "catchers" were constatntly dropping by to check on status. Debbie Klein, OPD coordinator for COAR and volunteers, (center) at the Orange PD chats with Bob-AF6C on sending a message, as a driver stands by. 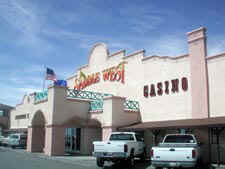 The Sandy Valley Road location is in the middle of "no where". However, "Sandy Valley" is the perfect location for the fourth communications center used by COAR for the OPD. 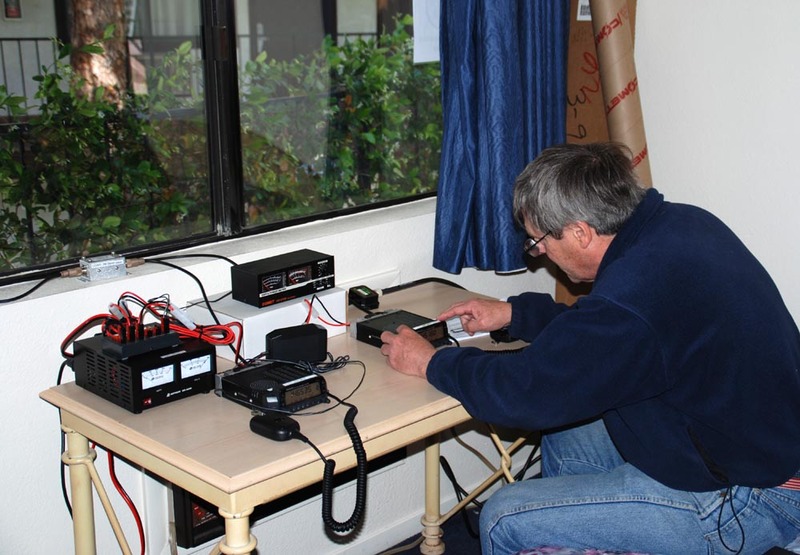 The trailer of George-KK6KN provided a wind-free location for operating and cooking. 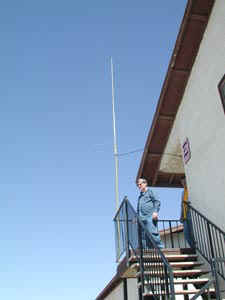 A cross-band repeater is set-up for the use of COAR at this location. The station uses a 440 beam antenna for communications on the East side of the mountain into Las Vegas and 2M high gain vertical antenna for communications on the West side of the mountain as far as the town of Shoshone. (L-R) Bruce-KC6DLA, ??? ?, George-KK6KN, and Les-KM6SQ have the mast vertical...and are about to extend the antennas to full hight. 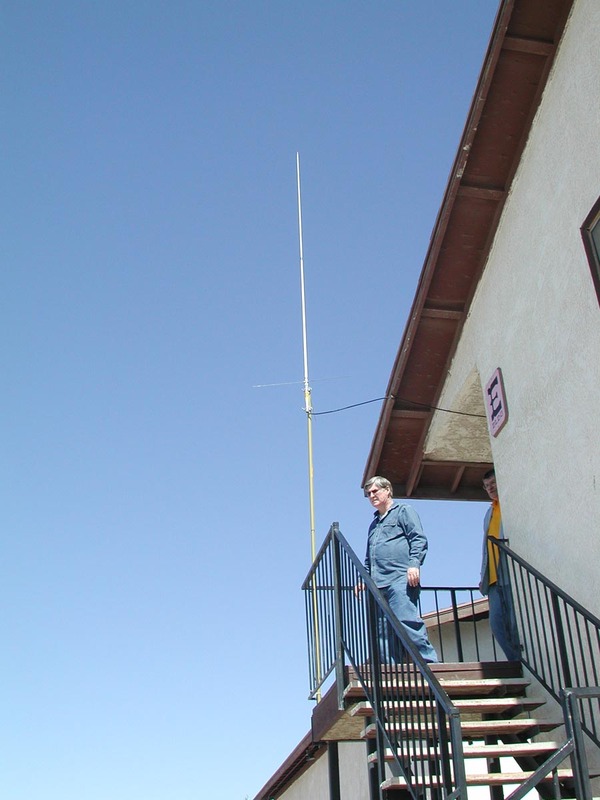 With George-KK6KN on the ladder, the antenna masts go higher and higher. Seems like the wind is already very brisk from the shape of the flag. 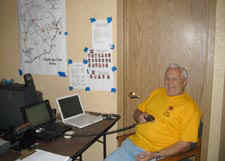 After all the antenna set-up effort was completed, George-KK6KN treated all the workers to a "country breakfast". 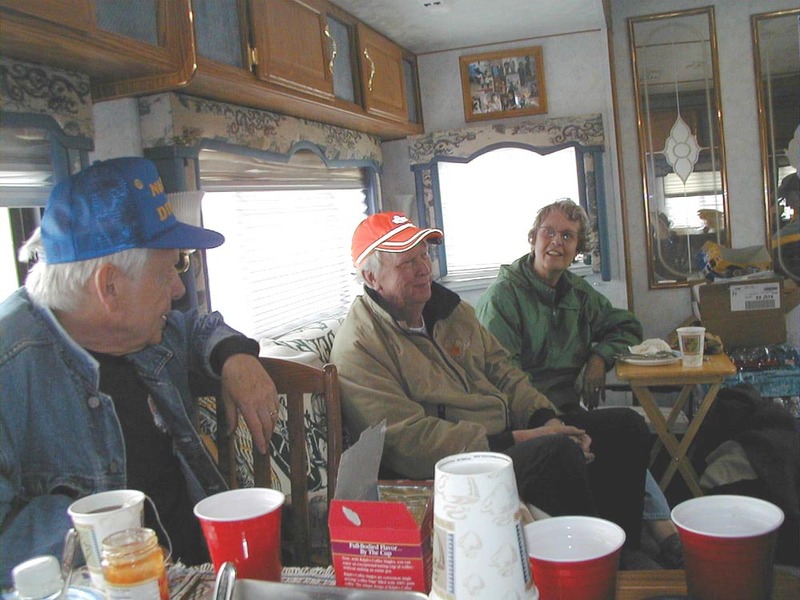 L-R are Dieter-N6ZKD, Bruce-KC6DLA, and Bruce's wife, Ann. 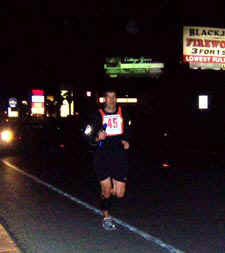 The fifth OPD communications center was located in the Emerald Suits, near the finish line for the race. Here two of the five ops, Dieter-N6ZKD and Jay - KK6OZ, are completing the set-up at the Las Vegas communications center. 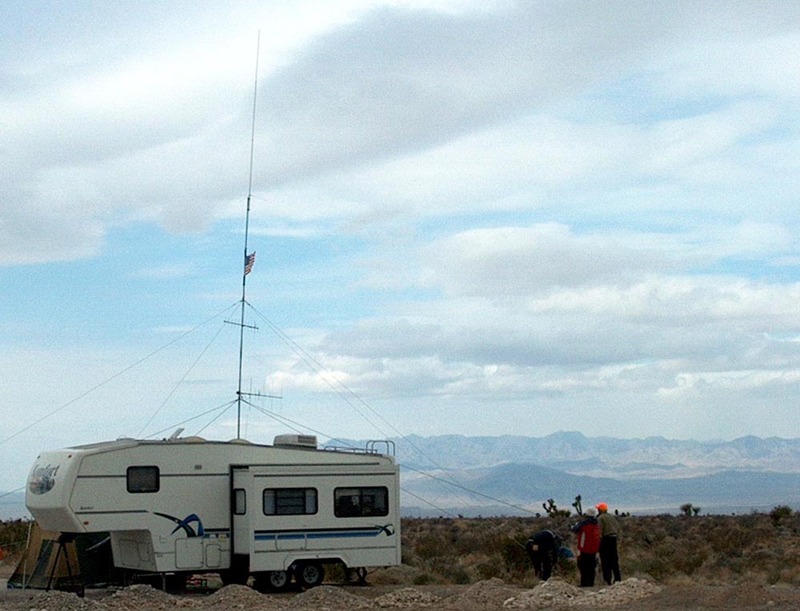 At the Las Vegas communications center, all the antennas are aimed at the top of the mountain pass. 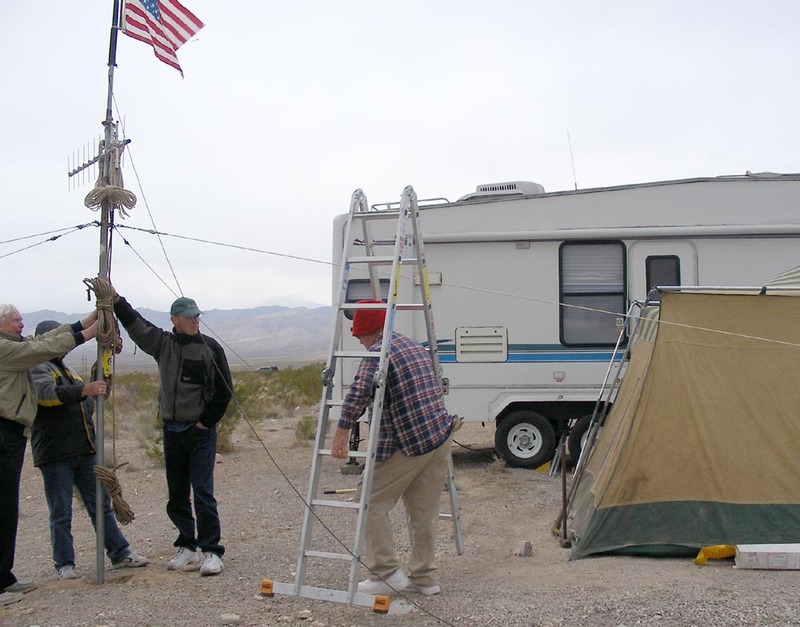 The OPD Las Vegas team made use of a cross-band repeater located at Sandy Valley Road comm. center. 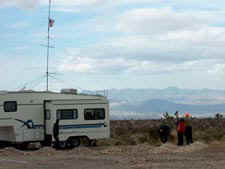 They would hear all the backbone 144 MHz messages on the other side of the mountains being rebroadcast on 446 MHz (and vice versa). Here is a clear view of the Las Vegas comm center, with Jay - KK6OZ in charge...and the wall lined with a map and photos of all the OPD runners.